The Bharatiya Janata Party (BJP) and Shiv Sena on Monday announced their pre-poll alliance for the Maharashtra Lok Sabha (LS) and Assembly polls. 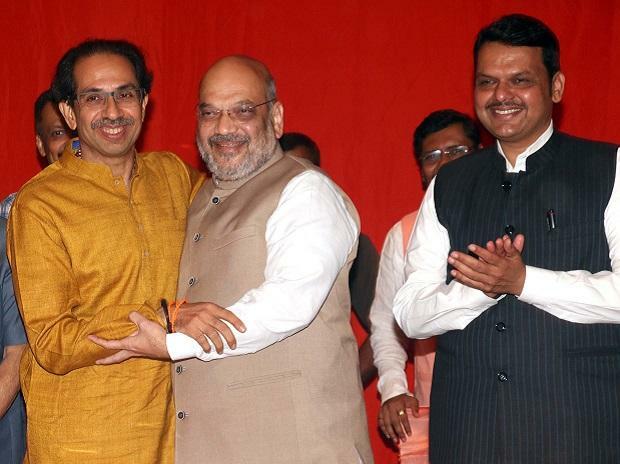 According to the seat-sharing deal, the BJP will contest 25 and the Sena 23 of Maharashtra’s 48 LS seats. In the Assembly polls, scheduled for October, the two parties agreed to contest an equal number of the state’s 288 seats, and accommodate potential allies equally within their respective shares of 144 seats each. The announcement at a press conference in Mumbai by Maharashtra Chief Minister Devendra Fadnavis, with BJP President Amit Shah and Sena chief Uddhav Thackeray present, brings the curtain down on months of bluster by the Sena that it could walk out of the alliance. Maharashtra sends 48 MPs to the LS, second only to Uttar Pradesh’s (UP’s) 80. In 2014, the BJP and Sena alliance had won 42 of the 48 seats, including a seat won by Swabhimani Paksha leader Raju Shetti. Shetti walked out of the National Democratic Alliance (NDA) in 2017. He is now part of the Congress and Nationalist Congress Party alliance in Maharashtra. In 2014 LS polls, the BJP had won 23 and the Sena 18 seats. However, the two had parted ways for the Assembly polls held months after the LS polls, with the BJP emerging the single-largest party by winning 122 seats and the Sena winning 63 seats. The relations between the two parties have been fraught with tension in the last five years, but the Sena has continued to be part of the coalition government in Maharashtra as well as at the Centre. At the press conference in Mumbai, Shah said the alliance would win 45 of the state’s 48 seats. “Our association with the Sena goes beyond politics. We are bound by a desire to see a strong and developed India. The decision to contest together strengthens the NDA significantly. I am sure our alliance is going to be Maharashtra’s first and only choice!” Prime Minister Narendra Modi tweeted. In the last couple of months, the BJP has showed signs of accommodating the demands of its allies, first in Bihar and now Maharashtra. Last month, the BJP and the Janata Dal (United), or JD(U), announced their alliance in Bihar with the BJP surrendering five of its sitting seats. In 2014, the BJP bagged 22 seats in Bihar. However, it will contest only 17 seats in 2019. Nitish Kumar-led JD(U) will fight an equal number, with Ram Vilas Paswan-led Lok Janshakti Party contesting six of Bihar’s 40 seats. The BJP is preparing for the eventuality that it might not be able to repeat its 2014 LS tally of winning a simple majority on its own. Apart from Shetti, the BJP has also lost the Telugu Desam Party as an ally. In 2014, the BJP had managed to win all of nearly all of the seats in Rajasthan, Gujarat, Madhya Pradesh, Rajasthan, Chhattisgarh, Jharkhand, and UP. Along with its allies, the BJP had won majority of the seats in Maharashtra and Bihar.